Former NFL athlete Shawne Merriman is issuing a warning to current and future athletes: protect your personal brand at all stages of your career. Former NFL athlete Shawne Merriman is issuing a warning to current and future athletes: protect your personal brand at all stages of your career. Merriman learned the hard way and is now taking on Nike in a case of unfair competition and trademark infringement of his LIGHTS OUT® brand, which has been synonymous with Merriman for almost a decade according to a lawsuit filed in U.S. District Court for the Southern District of California, Case No. 14cv00872 (JAH) (NLS). The suit was filed by his company, Lights Out Holdings, LLC in California Federal Court and demands immediate injunctive relief to stop Nike’s actions, and millions of dollars of damages including “statutory damages of up to $2 million per content mark per type of goods or services sold, offered for sale or distribution . . .” as noted in the complaint. The LIGHTS OUT trademark registration covers a broad range of apparel, listing: “clothing for men, women and children, mainly, bottoms, boxer shorts, caps, hats, headwear, nightwear, shirts, shorts, sleepwear, sweatshirts, tank tops, tops, t-shirts, underwear.” Items from the brand have been sold at retail locations across the country as well as on the brands website Lightsoutbrand.com. for several years. Because Merriman’s company has had rights in the LIGHTS OUT mark for so long, the trademark has been deemed incontestable by the U.S. Patent and Trademark Office. The suit, filed by attorney Andrew Skale of Mintz Levin’s San Diego office, demands a preliminary and permanent injunction for trademark infringement and related unfair business practices by Nike in addition to a damages amount to be determined at trial, disgorgement of Nike’s profits and treble damages for willful infringement, as noted in the complaint. 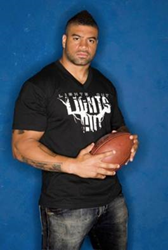 Shawne Merriman was given the nickname "Lights Out" in high school for his hard-hitting style of play. He knew right away that “Lights Out” was more than just a nickname, and set out to parlay the success of the “Light Out” ® trademark into a globally recognized Luxury Lifestyle Brand that features affordable items for all. Shawne had an amazing career in the NFL, playing with both the San Diego Chargers and the Buffalo Bills. Shawne is a three-time NFL Pro Bowler and NFL All Pro and was named the 2005 AP NFL Defensive Rookie of the Year. Shawne is currently an analyst for The NFL Network and the WWE. He has taken a special interest in contributing to the Salvation Army, Standing Up For Kids and Feeding America while establishing the "Lights On Foundation" in an effort to help children and families in need.